This month I was thinking about the event and I realized, it should be festivities continued. Holidays galore in December month, bringing floods of invites, parties and festive food. So I decided to continue with November month's theme of Festive foods. I would love to see what you would bring to the Holiday table. For the coming year I want to start a new concept with Bon Vivant. From January of 2013 on wards I will be choosing my favorite recipe for the month to feature. Here are some of the guidelines I will be following. - It will be titled "Favorite Bon Vivant of the Month"
- I will choose a recipe from all the entries to Bon Vivant in the previous month (in this case, it will be Nov-Dec of 2012 Bon Vivant). - I will inform the owner of the recipe before-hand about the selection, so if you have any apprehension you can let me know and I will pick another one to feature. Also I will wait for two days for reply, just so that I don't wait too long to choose another one. - I will try that recipe in the next month, take pictures, but link for recipe will be given to the original recipe of yours. So I will feature you, your blog and your recipe on my blog. A humble note: I am featuring one recipe a month, that does not mean that other participants weren't good enough. It's just that I liked the recipe and wanted to try it immediately. Solely based on my instincts and discretion. ~ Linking back to this announcement page is mandatory to get the word out. I have noticed many of them are not back linked. I will have to promptly remove them if not linked back after one notice. ~ Blog post should be in month of November or December. ~ Two old posts are allowed, if re-posted again in November or December. Nice to know that this festive event is open for another month!! question on the new event - from where will you choose the recipe to try? From the previously submitted ones to Bon Viviant events? Hi Sowmya, I will choose the recipe from the previous month Bon Vivant. 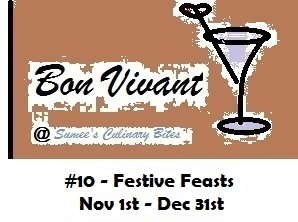 That is, since I am starting this from next month (Jan) I will only be choosing ONE from Non-Dec Bon Vivant - Festive Feasts.. And in Feb I will be featuring one from Jan Bon Vivant and so on... Hope that explains it.. Thanks always for dropping in.. Thanks for hosting this event Sumee. I just added mine.